Get ready to hear a knock on your door Jacksonians; city officials will be at your doorstep soon. 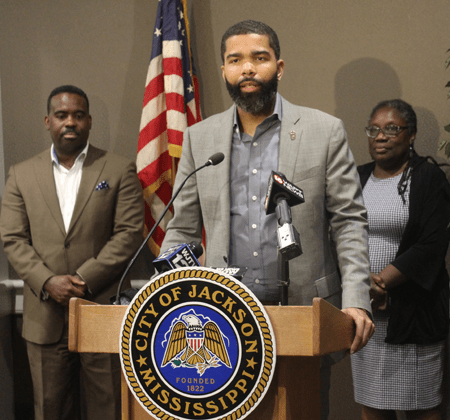 In a weekly press briefing, Mayor Chokwe Antar Lumumba shared his excitement about the outreach efforts of the organization One Voice, as they soon will engage in a short-term door knocking campaign to garner input from the citizens in Jackson about what it will take to transform the Jackson Public School District (JPS), a district that has been on a decline for several years. The canvassing project proposed by the Better Together Commission has support from community partners such as the Kellogg Foundation, Jackson Public School District and its administration. After JPS faced a possible takeover by the state in October 2017 for failure to meet numerous accreditation standards and receiving its second “F” in the school system ranking by The Mississippi Statewide Accountability System, Lumumba believed it was necessary to join forces with Governor Phil Bryant and the Kellogg Foundation and as a result, the Better Together Commission was formed to help the district return to its passing ranks and halt a takeover by the Mississippi Department of Education. “We believe we owe our children the best. We do not feel that we can move forward with a transformational school district without engaging the public in every possible way we can,” expressed the mayor. With the understanding that not all citizens can attend public hearings regarding the new vision for JPS, the Better Together Commission decided to meet the people of Jackson where they are – in their homes. “If we can’t reach you by attending our public hearings, we are going to come to you and knock on your door. We want to engage our citizens, so we can have a deeper understanding of what the needs, goals and aspirations are for our school district,” said Lumumba. Nsombi Lambright, executive director of One Voice, encouraged residents to help in the process of revitalizing the schools across the metropolitan area by completing a questionnaire. “It is critical to be able to talk to families and community stakeholders about what they want to see the Jackson Public School district become,” said Lambright. Lambright said One Voice is an organization dedicated to preserving the public education system in Mississippi. In order to get citizens’ feedback on JPS, One Voice will utilize their privately-owned Voter Activation Network (VAN), a database which shows individuals who have engaged in recent elections, non-registered voters and individuals who are eligible to vote in Jackson, to determine where to deliver surveys first as they embark on their mission to visit 60,000 households throughout city. For persons who have not been involved in recent political processes, survey tools will be distributed by canvassers to collect data of the priorities Jackson citizens have. She also encouraged civic groups, community stakeholders and church groups to volunteer as door knockers in neighborhoods across the city to improve the state of JPS. “We would love to have community groups volunteer with us to go out into the community and canvass with us,” expressed Lambright. Not only will the organization and city officials tag along on the campaign trail, but neighborhood association members will also be asked to participate in the stride to making the school system better. Lumumba expressed in order to change the outlook of JPS, parents, students and alumni have to unite and contribute their beliefs at the door-to-door operation that the administration has formed to benefit the next generation of students. “We believe in collective genius – we do not believe we are smart enough by ourselves in order to figure out our problems, so this allows us to engage citizens, allows them to be more a part of the process, and give the students the very best district they deserve,” said Lumumba. Applications to become a participant of the Door Knocking Campaign can be completed at http://onevoicems.org. Individuals ages 18 and older are eligible to apply.